Take it to the next level, real ballers have it made custom. 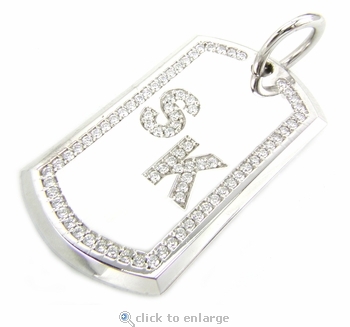 You too can have your own custom made Personalized Initial Dog Tag Pave Set Cubic Zirconia Pendant that sport your initials. 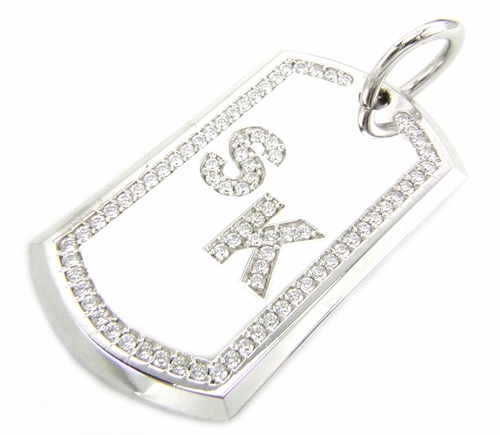 The hippest look today features a 14k solid gold dog tag with a single row of pave set round cubic zirconia that adds the right amount of sparkle around your neck, except this one also has your personal initials pave encrusted on the face. Our diamond quality Russian formula cubic zirconia are hand cut and hand polished to exact diamond specifications for the best possible finished product. The pendant weighs approximately 15 grams and is solid, no hollow back. The total carat weight is approximately 2.5 carats. It measures 23mm in width and 39.5mm in height, not including the bail. These are custom made with your personal initials and are a special order. Choose from 14k white gold or 14k yellow gold. For further assistance, please call us directly at 1-866-942-6663 or visit us via live chat and speak with a knowledgeable representative.